Please click here for a map of the route. N.B. ferry (£1) operates from 10am to 5pm or dusk if earlier, except in lightning: December - February, weekends only; March - September, all week; October - November, closed. Park at The Coach and Horses, 8 Kew Green, TW9 3BH. (Free unrestricted parking around the centre of Kew Green, and in and off Priory Road.) Food is served all afternoon until 10:00 PM Mon-Sat. Food is served all afternoon until 9:00 PM Sun. From The Coach and Horses, follow Kew Bridge Road across the Green and, as it passes between the Caxton building and the ASK building, ensure you are on the left-hand pavement. Cross the river via Kew Bridge then turn left down a staircase to reach the Thames Path, turning right to proceed upstream alongside houseboats. Ignore several sets of steps that ascend to apartments or to High Street, instead continuing riverside of flats until you’re facing a “Victoria Steps Quay” sign – where you ascend via steps to emerge opposite The Musical Museum. Turn left and proceed straight along High Street without digression, all the way through Brentford town centre (half a mile) until it crosses the River Brent and becomes London Road. After passing a newsagents, turn left to follow the pedestrian route to Syon Park. Maintain direction at the car park. Alongside the visitor centre, bear left and follow the gravel footpath all the way to the exit gateway from the park. Turn left and pass in front of Isleworth Parish Church (All Saints’) before continuing along Church Street and reaching a small bridge. Immediately after the bridge take the path on the left (unmarked) that continues along the river. Turn right immediately beyond the Town Wharf pub, into Swan Street, then left into North Street. Proceed straight ahead into Richmond Road (which is to the left of The Castle pub). Just after the small bridge, turn left into Railshead Road to reach a riverside park. Pass the decorative Richmond Lock footbridge; and under Twickenham Bridge and a railway bridge; then proceed along Ducks Walk to reach Richmond Bridge. Here turn right, take the safe pedestrian crossing, turn left onto the slipway leading back to the river, and then continue upstream along the towpath, eventually passing luxury flats, an old house, Cambridge Park Footpath and the beginning of the Marble Hill grounds, all on your right. A ‘summer gate’, at the bottom of steps, leads into the Marble Hill grounds. Ignore this gate but proceed to a second, wider, gate and enter the grounds. You have reached the half way point of the walk. Proceed along the main path, passing a black walnut tree (reputedly one of the largest in the country) on your right and Henrietta Howard’s grotto on your left. Continue on the main path. Take the second path on the left to pass in front of Marble Hill House and an ice-house on your left and the former Coach House (sometimes open as a café) on your right before emerging onto a lane opposite Park Cottage and The Garden Cottage. Turn left and beware cyclists. When you arrive back at the towpath, turn left and in a short distance reach Hammerton’s Ferry. Take the ferry back to the south bank of the Thames. 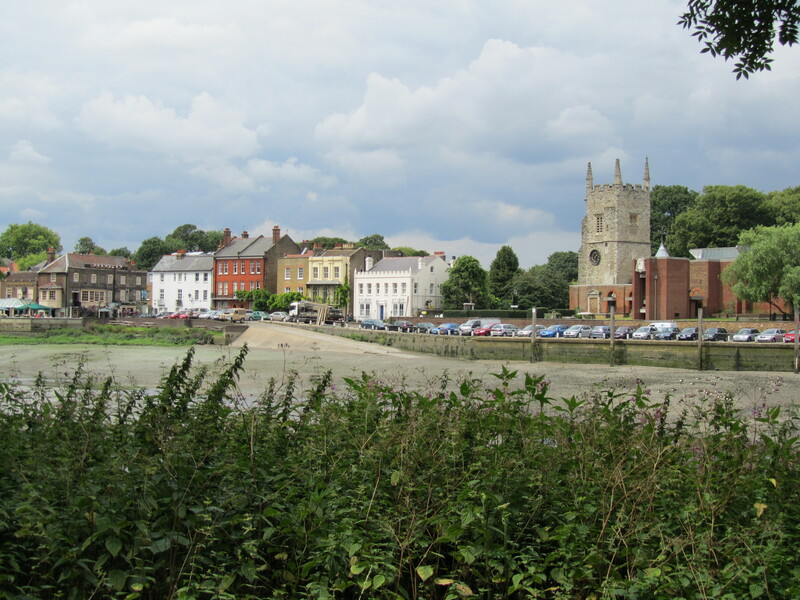 On disembarking the ferry, turn left to follow the towpath back to Richmond Bridge - a walk of about 1.25 miles. Along the way the former Royal Star and Garter Home appears on your right, perched high on Richmond Hill. From Richmond Bridge, continue along the towpath, prone to severe flooding. (If affected, divert via Water Lane, King Street and Old Palace Lane. Add 0.25 hours to the total walk.) Pass the railway bridge and Twickenham Bridge that you earlier passed on the other side of the river. (Just after Twickenham Bridge, you cross the original pre-1884 meridian line and note a sign inviting you to spot the King’s Observatory.) The path along this route is shared with cyclists, so again beware. Pass Richmond Lock footbridge on your left and later look out for All Saints’ across the river. Shortly after this, cross the old meridian line again before passing the Old Deer Park on your right (this part of the Park is now the Royal Mid-Surrey Golf Club). 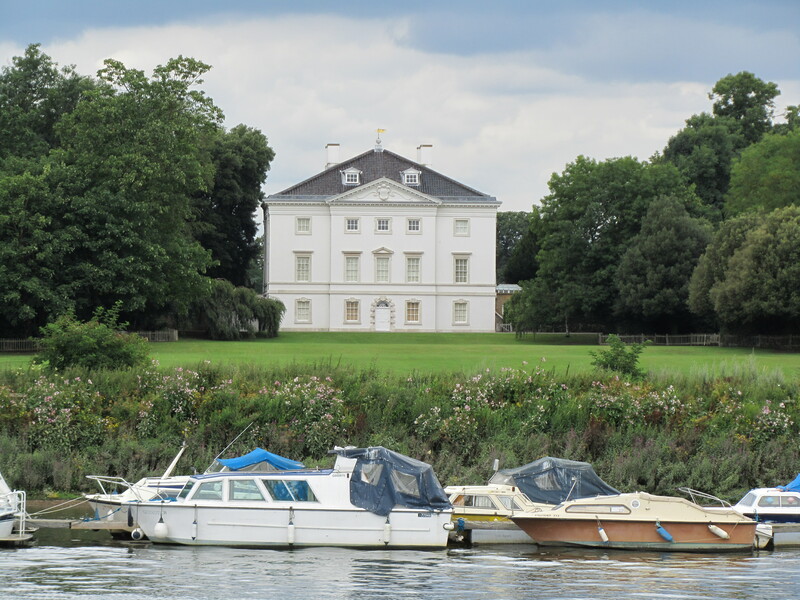 Further on, as you draw alongside Kew Gardens, you get a fine view of Syon House on the north bank. Nearly a mile after this, Kew Palace comes into view on your right behind a car park. After passing the backs of various properties, you reach Kew Bridge. Turn right after the arch to reach the Caxton building, then retrace your steps to The Coach and Horses pub. This route was last walked on 3 April 2019, and the directions were accurate then. Please e-mail me if you find any errors, if you would like a copy in Word format, or if you would prefer a version that starts and ends at Kew Bridge station. Return to my Surrey walks page.